This traditional American lock is constructed of heavy duty, die-cast solid brass and top-quality internal components to ensure smooth, long-lasting operation. 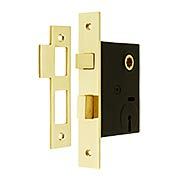 Pair it with one of our many latching-door sets to create your own custom combination. Available in eight popular finishes, it’s suited for almost any decor. For an additional charge, we can have your deadbolts keyed alike or with a double cylinder. Please give us a call to place your order. This high-quality mortise lock is an excellent choice for new doors, or as a replacement for a worn or broken early 20th century lock. It features premium precision components, a solid-brass faceplate and strike, and a steel case. The set comes complete with two brass skeleton keys and is reversible for left or right-hand doors. Available in an array of our most popular finishes, it’s suited for almost any décor. 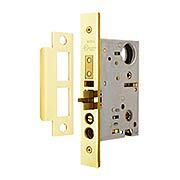 This standard mortise lock is made of solid steel and features an economical brass-plated face and strike plate. The set comes complete with two skeleton keys and is reversible for left- or right-hand doors. 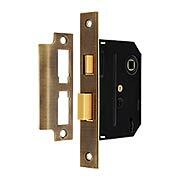 This standard mortise lock features solid-brass face and strike plates. It comes equipped for a privacy thumb turn, and is reversible for left- or right-hand doors. With three popular finishes to choose from, it is suited for almost any decor. 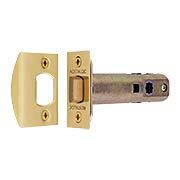 The narrow backset makes this lock ideal for French and pantry doors. It features solid-brass face and strike plates, and a steel case. The set comes complete with two brass skeleton keys and is reversible for left- or right-hand doors. With three popular finishes to choose from, it’s suited for almost any decor. 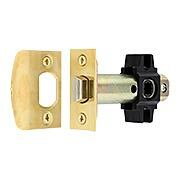 This economical Standard Tubular Conversion Latch is a great choice for use with antique or reproduction door knobs. 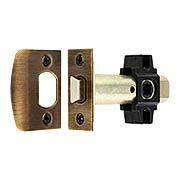 Designed for a standard 5/16-inch spindle, it features a brass-plated strike and faceplates. 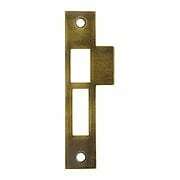 This high-quality tubular privacy latch is an excellent choice for use with antique or reproduction door knobs. Designed for a standard 5/16" spindle, it features solid-brass strike and faceplates, and its precision components lend smooth operation. Match the decor of any room with your choice of seven classic finishes. 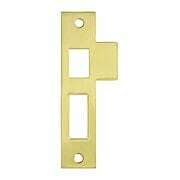 The narrow backset of this mortise latch is ideal for use on smaller French, pantry, or screen doors. 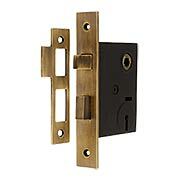 It features solid-brass face and strike plates, interior components, and box. This set works best with a small rosette or plate and lever handle. Whether for a new door, or a replacement for an old or broken plate, this sturdy t-strike is the perfect solution. The stamped-brass construction is made to last—helping to keep your doors working smoothly for years to come. It’s reversible for left or right handing and comes in your choice of three popular finishes. When replacing a missing, or an old or broken strike plate for a mortise lock, look no further than this authentic reproduction. 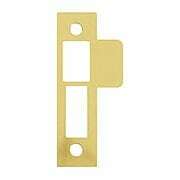 The steel construction has an economical brass plating. Our sturdy reproduction Mortise Strike Plate (3 1/2-Inch) is perfect for replacing a missing, or an old or broken strike plate for an antique mortise lock. The solid-brass construction is made to last—helping to keep your doors working smoothly for years to come. It comes in an array of popular finish options, and it’s reversible for left or right handing. Our sturdy reproduction Mortise Strike Plate (4 1/2-Inch) is perfect for replacing a missing, or an old or broken strike plate for an antique mortise lock. The solid-brass construction is made to last—helping to keep your doors working smoothly for years to come. It comes in an array of popular finish options, and it’s reversible for left or right handing. 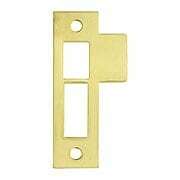 Large Brass Plated Replacement Strike Plate - 4 7/8" x 1 1/4"
When replacing a missing, or an old or broken strike plate for an antique mortise lock, look no further than this sturdy reproduction. The steel construction is made to last—helping to keep your doors working smoothly for years to come. It has a brass plated finish, and is reversible for left or right handing. This classic mortise lock is a reproduction of those used during the early 20th century. It features a 1/8” thick solid-brass face plate and interior components, and an old style cast-iron case. Available in an array of our most popular finishes, it’s suited for almost any décor. The set comes complete with two brass skeleton keys and is reversible for left- or right-hand doors. This classic mortise lock is a reproduction of those used during the early 20th century. 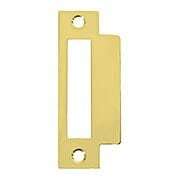 It features a 1/8” thick solid-brass face plate and interior components with a heavy cast zinc case. For added elegance, our exclusive Antique by-Hand finish ages gracefully over time into a beautiful natural patina. The set comes complete with two brass skeleton keys and is reversible for left or right-hand doors. When replacing a missing, or an old or broken strike plate for an antique entry-set mortise lock, look no further than this sturdy alternative. The solid-brass construction is made to last—helping to keep your doors working smoothly for years to come. It comes in our exclusive living antique patina, and it’s reversible for left or right handing. 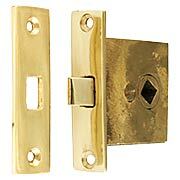 This high-quality tubular passage latch is an excellent choice for use with antique or reproduction door knobs. Designed for a standard 5/16" spindle, it features solid-brass strike and faceplates, and its precision components lend smooth operation. Match the decor of any room with your choice of seven classic finishes. 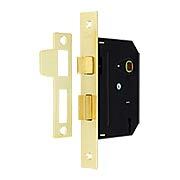 This heavy-duty, entrance mortise lock is an excellent choice for new, or as a replacement on older exterior doors. 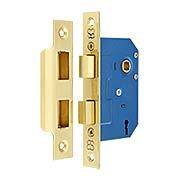 Designed for a 2 3/4" backset, it features solid-brass strike and faceplates, and comes equipped with an anti-friction latch for smooth operation. 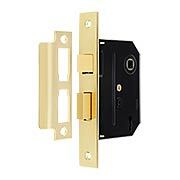 Its auxiliary latch allows for added security. 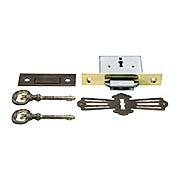 This set comes complete with a 1 1/8" cylinder, three standard keys, and is reversible for left or right-hand doors. Match the decor of any room with your choice of five classic finishes. 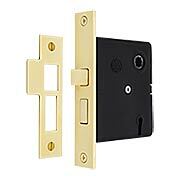 This heavy-duty, entrance mortise lock is an excellent choice for new, or as a replacement on older exterior doors. 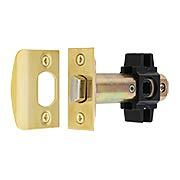 Designed for a 2 3/4" backset, it features solid-brass strike and faceplates, and comes equipped with an anti-friction latch for smooth operation. 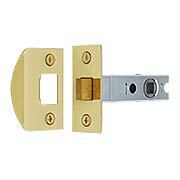 Its auxiliary latch allows for added security. 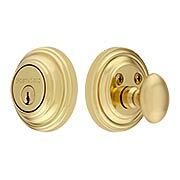 This set comes complete with a 1 1/8" cylinder, three standard keys, and is reversible for left or right-hand doors. Match the decor of any room with your choice of two popular finishes. 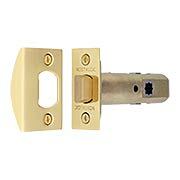 This high-quality tubular latch is an excellent choice for use with antique or reproduction door knobs. Designed for a standard 5/16" spindle, it features solid-brass strike and faceplates, and its precision components lend smooth operation. Match the decor of any room with your choice of five classic finishes. 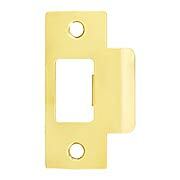 This high-quality tubular privacy latch is an excellent choice for use with antique or reproduction door knobs. Designed for a standard 5/16" spindle, it features solid-brass strike and faceplates, and its precision components lend smooth operation. Match the decor of any room with your choice of five classic finishes. This high-quality mortise lock is an excellent choice for new doors, or as a replacement for a worn or broken early 20th century lock. It includes premium precision components, a solid-brass faceplate and strike, and steel case. Adorned in our exclusive Antique-By-Hand finish, it ages gracefully over time into a beautiful natural patina. The set comes complete with two brass skeleton keys and is reversible for left- or right-hand doors. 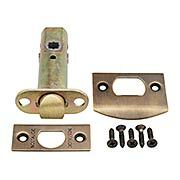 This high-quality tubular passage latch is an excellent choice for use with antique or reproduction door knobs. Designed for a standard 5/16" spindle, it features solid-brass strike and faceplates, and its precision components lend smooth operation. Our exclusive Antique-By-Hand is a living finish that ages gracefully over time into a beautiful natural patina. 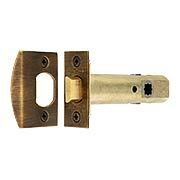 This high-quality tubular latch is an excellent choice for use with antique or reproduction door knobs. Designed for a standard 5/16" spindle, it features solid-brass strike and faceplates, and its precision components lend smooth operation. Our exclusive Antique-By-Hand is a living finish that ages gracefully over time into a beautiful natural patina. 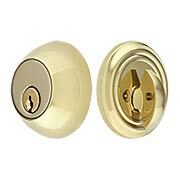 This traditional American lock is constructed of heavy-duty solid brass and top-quality internal components to ensure smooth, long-lasting operation. 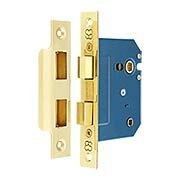 Pair it with one of our many latching-door sets to create your own custom combination. Available in six popular finishes, it's suited for almost any decor. This classic interior mortise lock is a reproduction of those used during the early 20th century. It features a 5/32” thick solid-brass face plate with a steel case and interior components. Available in three of our most popular finishes, it’s suited for almost any décor. The set comes complete with two brass skeleton keys and is reversible for left or right hand doors. 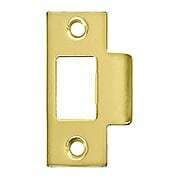 This high-quality tubular latch is an excellent choice for use with antique or reproduction door knobs. Designed for a standard 5/16" spindle, it features solid-brass strike and faceplates, and its precision components lend smooth operation. Presented in our exclusive Antique-by-Hand finish, it ages gracefully over time into a beautiful natural patina.